Morning ladies. The Mr woke me up early so I'm up and blogging whilst I drink gallons of coffee to ready myself for the day. Last night was FSNI and I had plans to baste and machine quilt my nephew's quilt. It was not to be. It's about time I learnt not to make plans! Instead my parents came round and I didn't settle down to sew until 9. That sounds like I didn't want them to come round - not true! I love to see my parents and I knew they were coming, I just mean it changed my sewing plans. 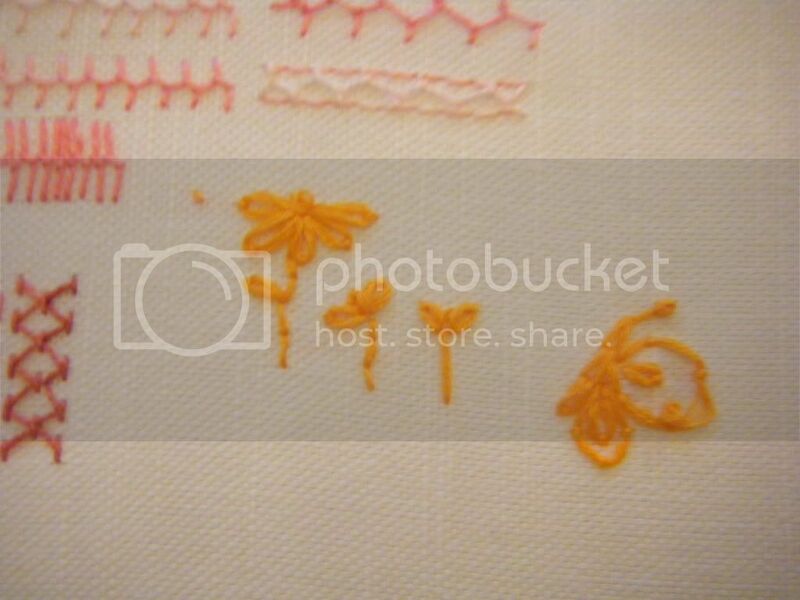 Instead, I decided to work on TAST week 7 - detatched chain stitch. 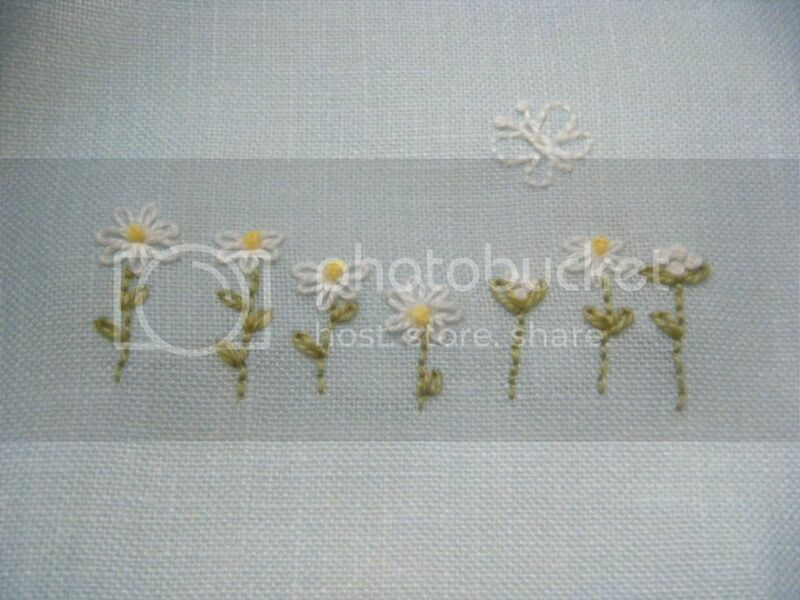 Now, this is also called the lasy daisy stitch and Sharon was saying we don't have to use it for flowers, but you know what, I got an idea into my head and flowers it was! First up is my little sampler. I used 4 strands of some cheapo floss I got free with a magazine and tried out my ideas. I know the butterfly in the picture only has one wing, but the floss came to an end and it was only a trial. His wings are made from giant detatched chains couched down in several places. Then I got a piece of thin blue linen and took out my perle 8s and began to sew. This is the first time I've used the Perle 8s for embroidery and I'm deeply in love. I'm not sure the side on daisies worked as well as I wanted them to - I feel my shape is better in the orange version. I also added the butterfly, but didn't make his wings from detatched chain as I didn't want to risk them going wonky - they went wonky anyway! Despite its imperfections (many) I LOVE this piece. I'm going to frame it up in a little embroidery hoop and hang it. I'll show you when I do. The picture above has a pen it in just to show you the size - I worked this as small as I could! So, I feel TAST 7 was a success. Last night was the last ever episode of Big Love, I'm heartbroken. I fell in love with this programme and with the family. 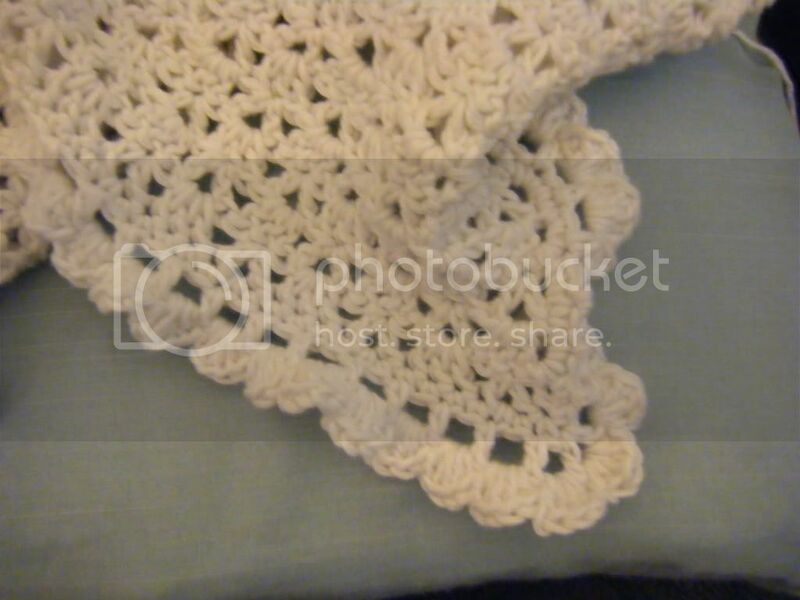 I had to sit up and watch it on Sky+ after Mr CA had gone to bed so I worked on the crochet baby blanket for my nephew. It's so close to being finished now and I'm putting on the last border round. It takes forever but I'm getting it done this weekend. Watch out for some finished items next week, oh and a post about the most incredible swap package I got! Your daisies are lovely and so tiny! Look forward to seeing them framed. The embroidery looks fab - I had no idea it was so teeny til you the pic with the pen in! 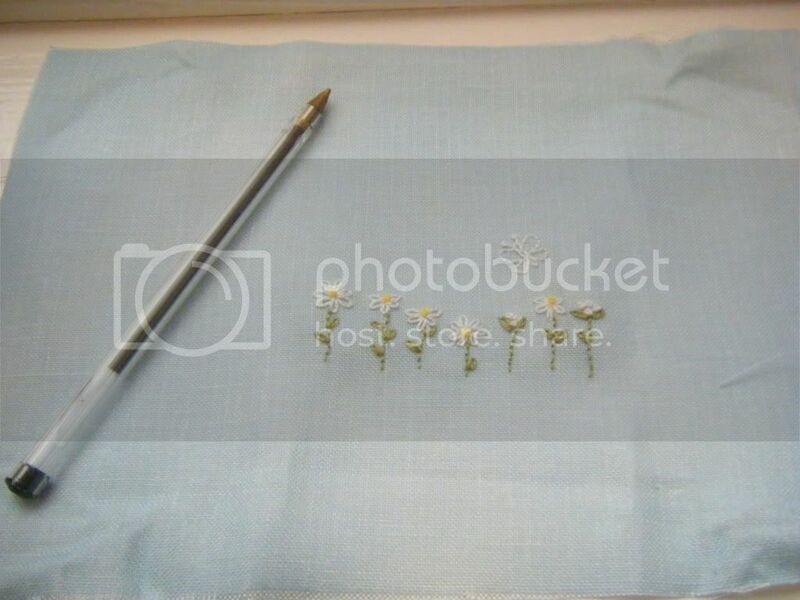 Your little daisy stitchery is cute - it will love sweet framed - or it would be a sweet insert for a zipper bag or tote!